Horror films and their monsters are designed to scare us, but for Chinese-Australian artist, Louise Zhang, rather than being fearful, instead they are her comfort and safe space. In this talk, she shares her deep passion for cinema horror as an art form and explores the idea of the monster and the monstrous as a way to exorcise her anxieties through art. Zhang graduated with a Masters of Fine Arts by Research at UNSW Art & Design (formally COFA) in 2016. 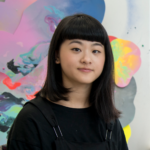 She recently completely residency programs at the Institute of Provocation, Beijing (Australia Council) and at Organhaus, Chongqing (China Residencies and Copyright Council) centring her research around the construct of diyu (Chinese hell).